Olivia came down for the weekend so she could unpack and repack some of her school items to get ready for her new dorm move. She, like me, has lots o’ stuff so it was necessary to make some dorm-worthy decisions. 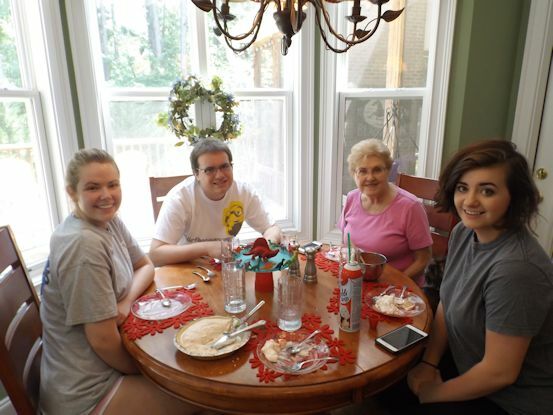 Davis’ girlfriend Allie joined us for Sunday lunch. I had planned a pasta bar with Baked Ziti, Garlic Bowties, and Vegetarian Lasagna. However, I ran out of time for the lasagna so it became a “Pasta Duo” instead of a “Pasta Bar.” And then, the Pie… Let’s just say that if I worked at Kraft, this is what the pie would have looked like. In a bowl mix together the yogurt and peach puree. In a separate bowl, whip the whipping cream until stiff; add the vanilla and powdered sugar. Blend together the yogurt mixture with the whipped cream. 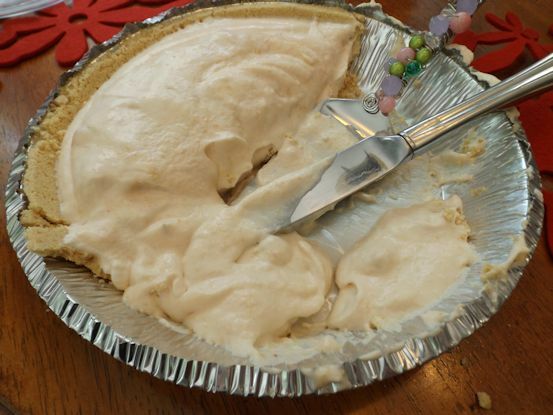 Place in a pie shell and freeze. Blend the frozen strawberries with 1/2 cup water. In a small cup mix together the corn starch and the 2 tablespoons water. In a small sauce pan, heat the strawberries and water. Add the cornstarch and water and cook until slightly thickened. 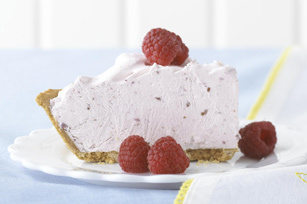 Chill and serve over the pie. Moving on from the pie. 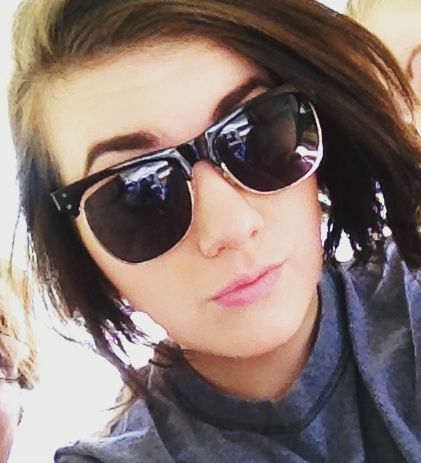 Olivia has a new secret hair cut. Very interesting and I love it. Here is the back of her hair. No big deal. Then, if you lift the back…. 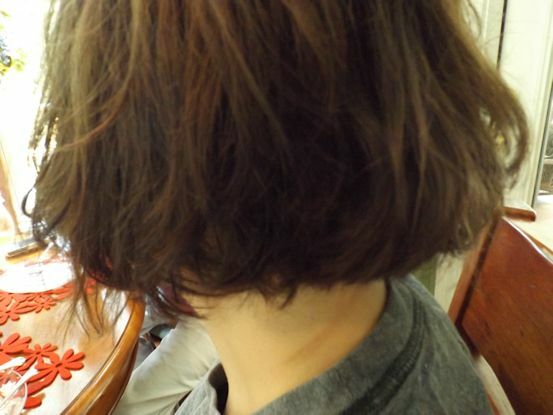 …you will see a lotus flower shaved on her neck and bottom three inches of hair. 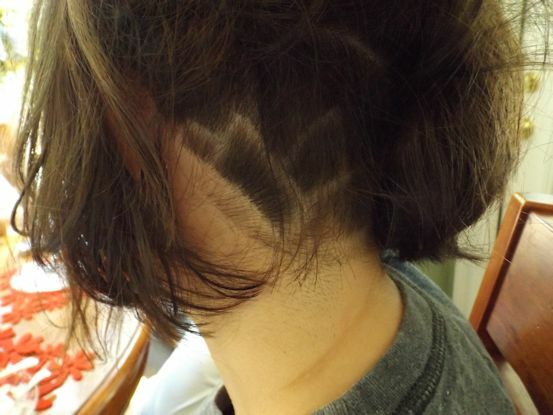 It is a fun trend called hair tattoos. You can be professional and normal looking, but then you have a secret fun side to the hair cut. Genius. She’s a cutie with her new secret do. After lunch, we decided we needed even more peach in our day, so we drove on down to Hollonville for some peach ice cream and a bag of O’Henry peaches. 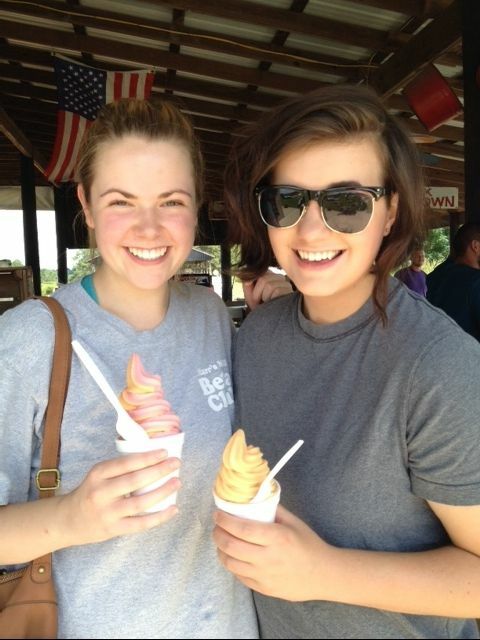 Here is Allie and Olivia with their cups of peach and strawberry swirl. Fun day! OLIVIA’S DO IS CUTE–BUT IT TAKES A LOT MORE HAIR THAN I HAVE!!! Looks like an incredibly fun day….